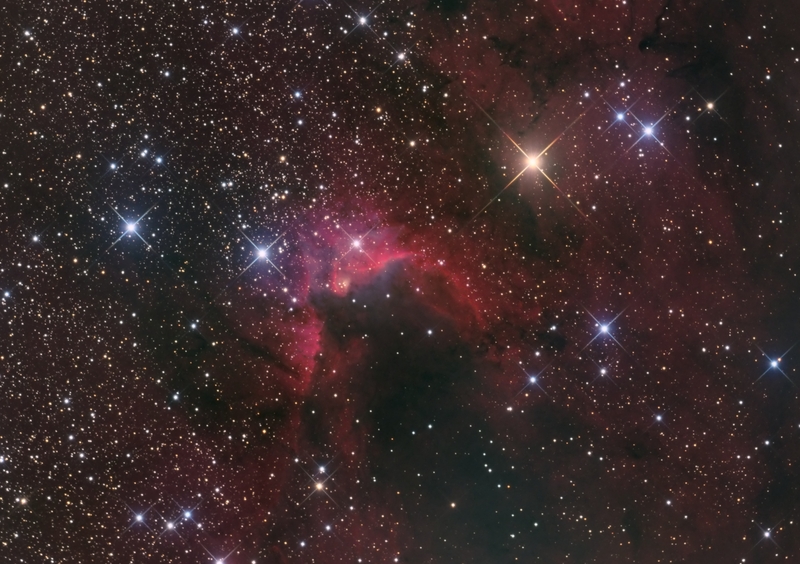 The Cave Nebula makes a very pretty picture with red emission nebula, blue and yellow reflection nebulae, dark nebulae and many colourful stars. 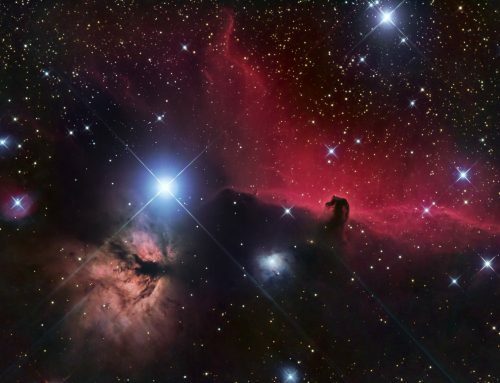 This object lies in the constellation Cepheus about 2,400 light years away, pretty close in cosmic terms. 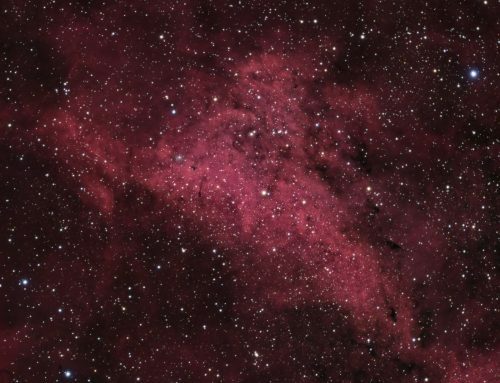 The nebula’s bright rim is ionized by the hot blue-white stars in the vicinity, primarily the bright star left of centre in this image. The main “cave” structure is 10 light years across. It is catalogued as Sharpless 155 (Sh2-155) and also as Caldwell 9 (the Caldwell catalogue was compiled by Sir Patrick Moore, and named for his mother’s maiden name). 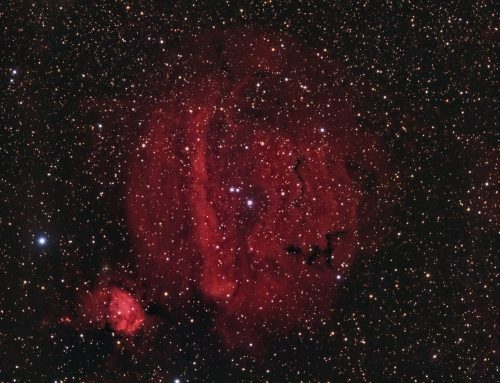 SBIG STL-11000M camera, Baader Ha, R, G and B filters, 10″ f/6.8 ASA astrograph, Paramount MX. Guided with QHY5 camera and 80 mm f/6 Stellar-Vue refractor. Acquisition and guiding with TheSkyX. Focusing with FocusMax. Automation with CCDCommander. 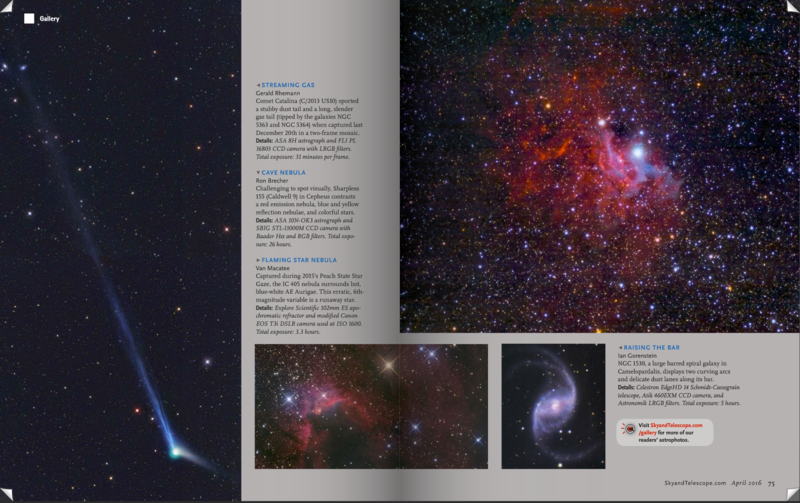 Calibration, cosmetic correction, registration, integration and all processing in PixInsight. Shot from my SkyShed in Guelph, Ontario. Moderate moonlight for Ha and no moon for RGB. Good to very good transparency and seeing throughout acquisition. 10x30m Ha, 28x15m R, 28x15mG and 28x15mB unbinned frames (total=26hr). Creation and cleanup: R, G, B and Ha masters were cropped and processed separately with DBE. The R,G and B channels were combined and the resulting RGB image was processed with ColorCalibration. The NBRGBCombine Script was applied to Ha and RGB with default settings to produce a linear HaRGB image. PixelMath was used to boost the blue by adding 5% Ha. Stretching: HistogramTransformation was applied to make a pleasing yet bright HaRGB image. TGV Noise was applied and the image was re-stretched to reset the black point. Creation and cleanup: The cleaned up Ha, R,G and B masters were combined using the ImageIntegration tool (average, additive with scaling, noise evaluation, iterative K-sigma / biweight midvariance, no pixel rejection) to create the SynthL channel. Deconvolution: A copy ofSynthL was stretched to use as a deconvolution mask. A star mask was made from unstretched SynthL to use as a local deringing support. Deconvolution was applied (100 iterations, regularized Richardson-Lucy, external PSF made using DynamicPSF tool with about 20 stars; local deringing at 70% and global dark deringing at 0.03). Stretching: HistogramTransformation was applied to make an image with similar brightness to the HaRGB image. To achieve this the luminance channel of the HaRGB was extracted and used for visual comparison. TGV Noise was applied using a mask to protect high-signal areas and the image was re-stretched to reset the black point. 2. Apply LinearFit using SynthL as the reference. 3. Use ChannelCombination in Lab mode to replace the HaRGB’s luminance with the fitted luminance from step 2. SynthLHaRGB: Overall contrast and brightness were increased slightly with the Curves tool. 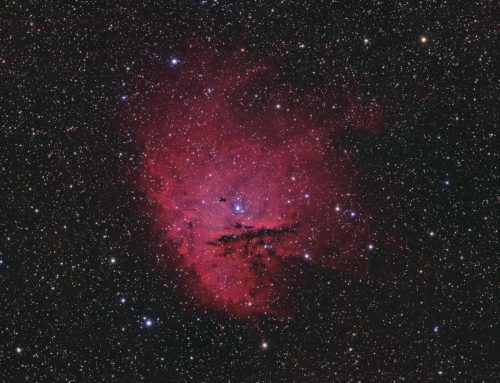 Blue areas of the nebula were slightly enhanced with an adjustment of a small part of the Blue channel in Curves using a range mask. Splendid! A lot of data, which has really paid off. Great to seethis – it is well belowmy horizon here. Glad you enjoyed it. And thanks for commenting.